With rocky ridges dropping straight into the Hebridean sea, 12 Munros to ascend, 12 km of continuous scrambling along a narrow crest taking a minimum of nine hours, plus six hours approach and descent, and superb views all the way … no wonder the Black Cuillin is recognised as one of the UK’s hardest and most spectacular challenges. 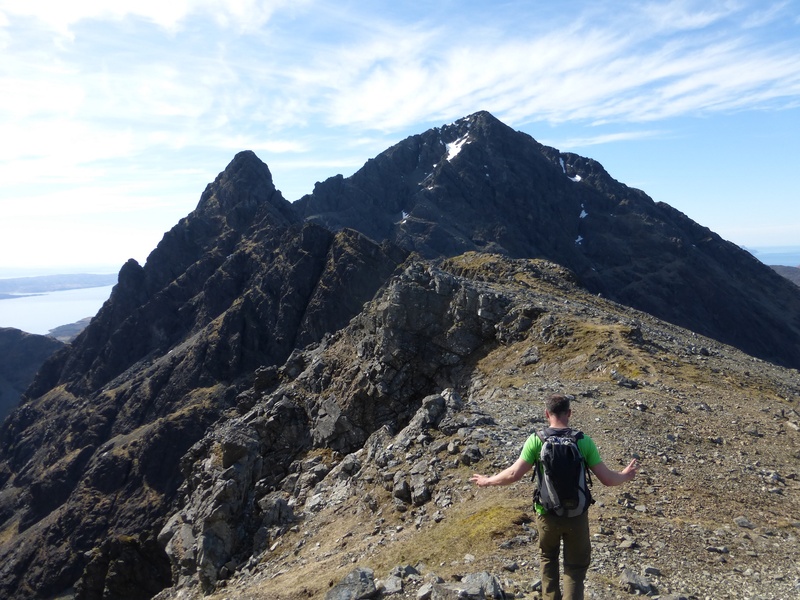 Earlier this year Climb it Range’s Jim Langley successfully took on the famous Cuillin traverse. Here’s his account. Back in April I planned a mountaineering trip up to Scotland with my friend Tim Harrop. 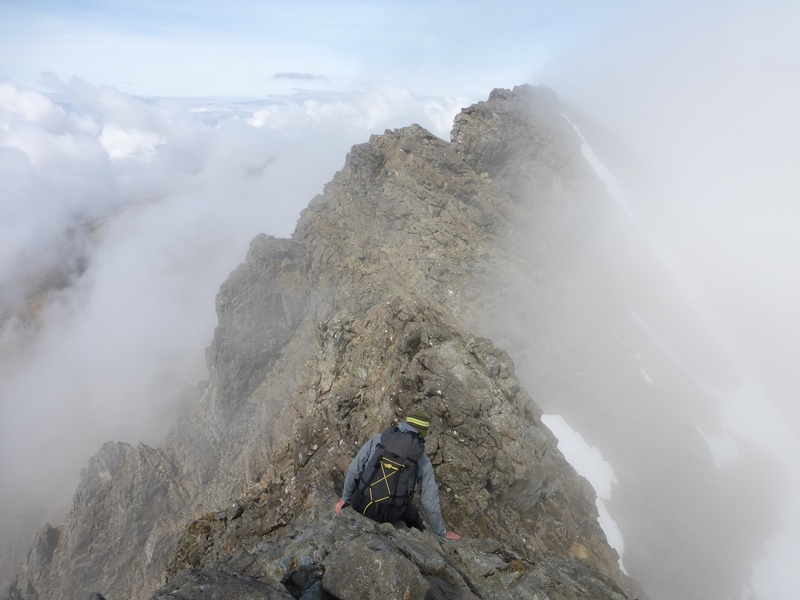 Our intention was to head over to the Isle of Skye and attempt a traverse of the Black Cuillin mountains. The weather usually plays a huge part in planning any such trip and the mountains are often cloaked in cloud and rain. The forecast was spectacular and this fuelled our excitement about the adventure. 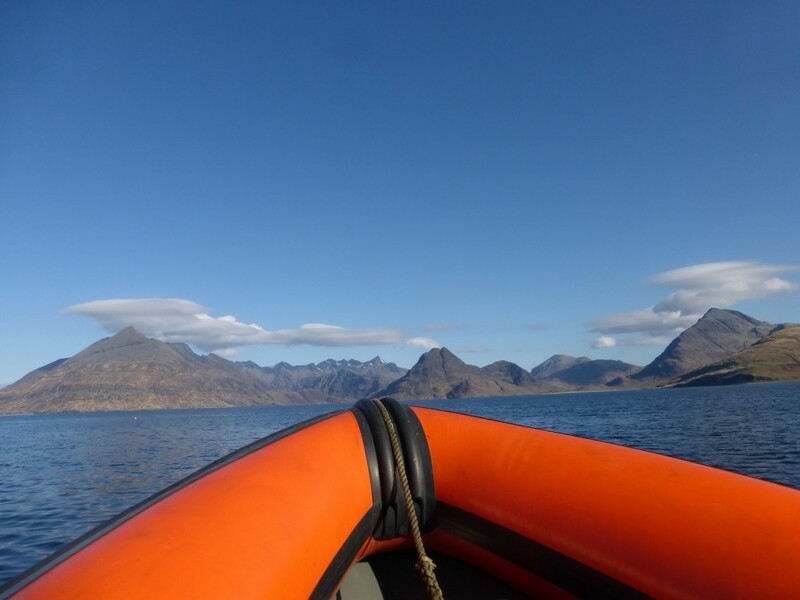 The Black Cuillin range is the most complex and technical mountain environment in the British Isles, with its jagged ridges that fall straight into the beautiful Hebridean Sea providing the setting for a unique mountain experience. 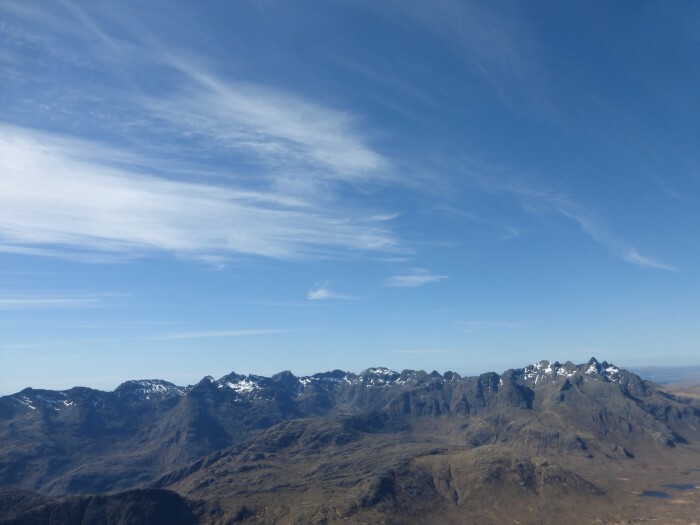 The Black Cuillin contain 12 of Scotland’s 283 Munros (a mountain with a summit height of more than 3,000 ft) and these are acknowledged as the hardest to climb. Linking them is even tougher, with many narrow ridges to scramble. Concentration is required on every step. A traverse of the ridge is no mean feat. 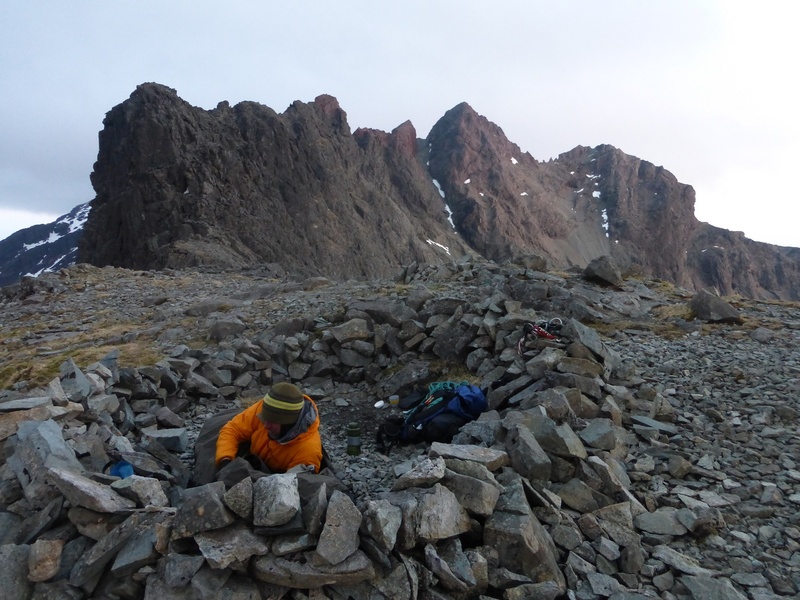 There are 12km of continuous scrambling mostly along a narrow crest with concentration required on every step. This takes approximately 9-15 hours to complete in ideal weather conditions and that’s not including the long approach and descent adding another 6 hours. With all this in mind we decided on a ‘warm up’ mountaineering day taking in Blaven (929m) and traversing the impressive summit of Clach Glas in the Black Cuillins (which lies away from the main ridge). This traverse is a superb outing combining exposed scrambling and easy rock climbs along a complicated ridge. We lunched on the Putting green after descending The Imposter (which is climbed grade moderate). 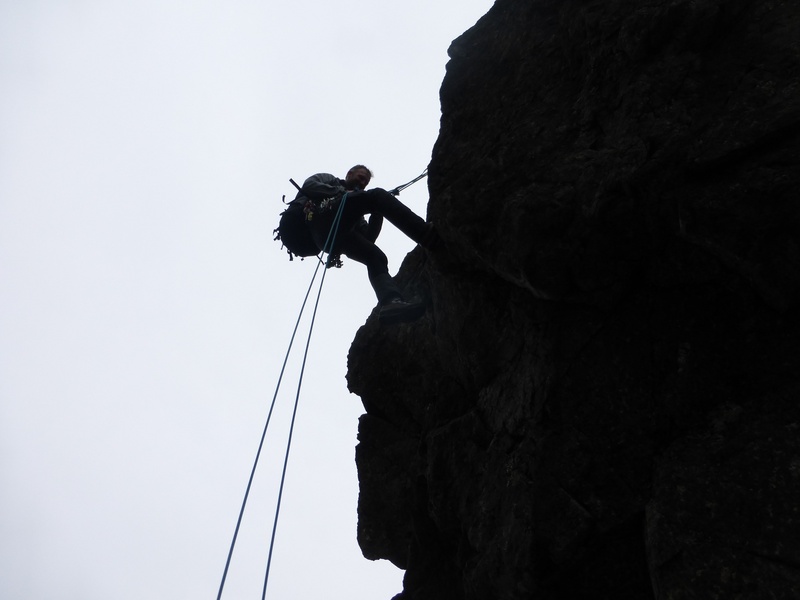 One final easy grade rock climb saw us reach the broad ridge of Blaven. 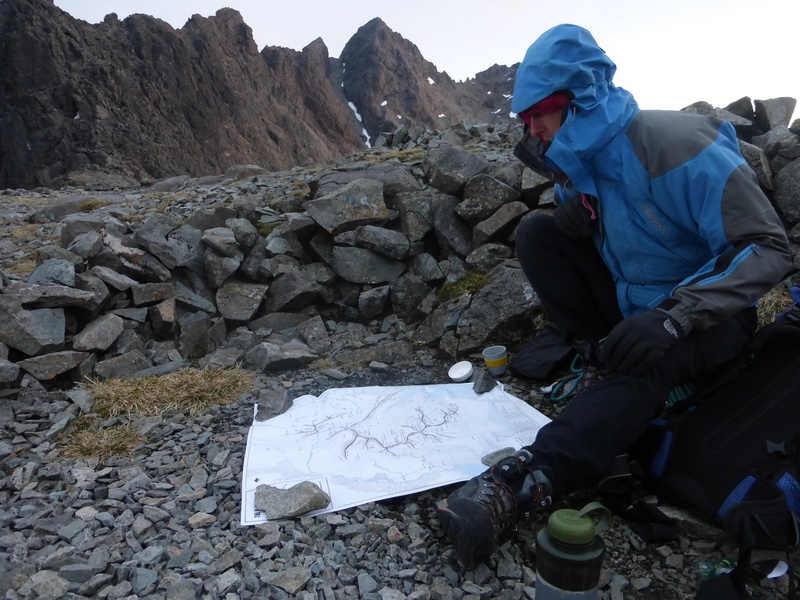 Having successfully comleted the warm up, it was now time to plan how we would tackle the main Cuillin ridge. 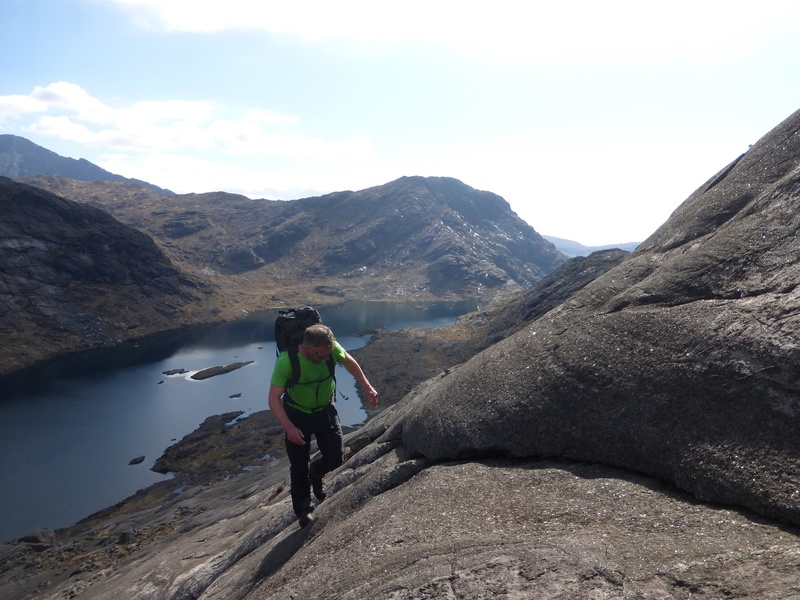 Tim had been to the area before and said an ascent via the Dubh slabs after a boat ride across Loch Scavaig from Elgol is an amazing approach, so we pursued this option. 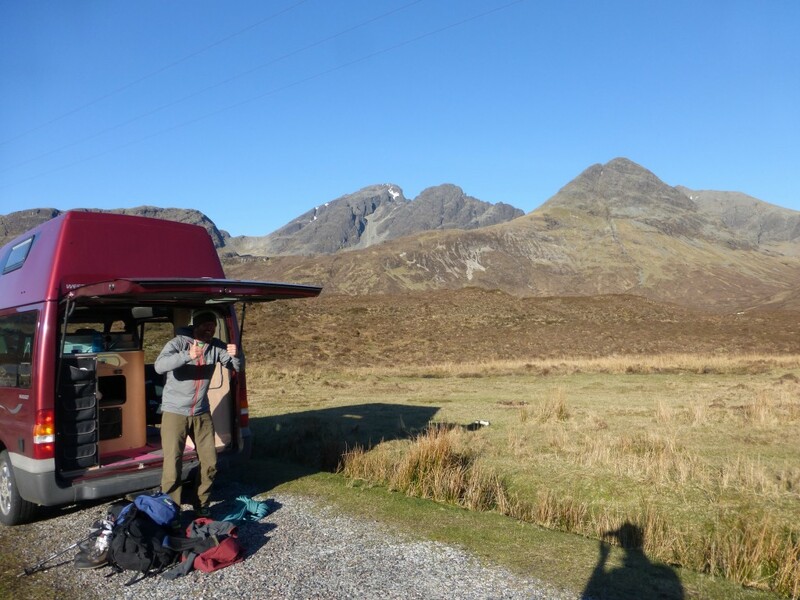 We left the van at Sligachan hotel and hitched around the following morning making for easier logistics for the traverse. After the rib ride across the Loch we ascended the Dubh slabs, a 35 degree rock slab climbing from sea level to 700m. This was an impressive ascent and the rock was positive and grippy. After our first abseil off the summit of Sgurr dubh mor we were on the main ridge. We made a bivvy after climbing the TD gap which Tim led (he’d packed his climbing shoes purposefully). When we woke up the following morning the weather had come in and cloud shrouded the summits obscuring our view and making our progress slower as route finding became very tricky. The ridge continued and we scrambled, climbed and abseiled our way northwards before leaving the ridge as dark fell at Bruach na frithe. It was one of the most technically difficult challenges I’d ever experienced, requiring concentration – quite literally – every step of the way. The black Cuillin justifiably deserves its reputation. It’s not an understatement to say the whole experience was amazing, and one which I will never forget.